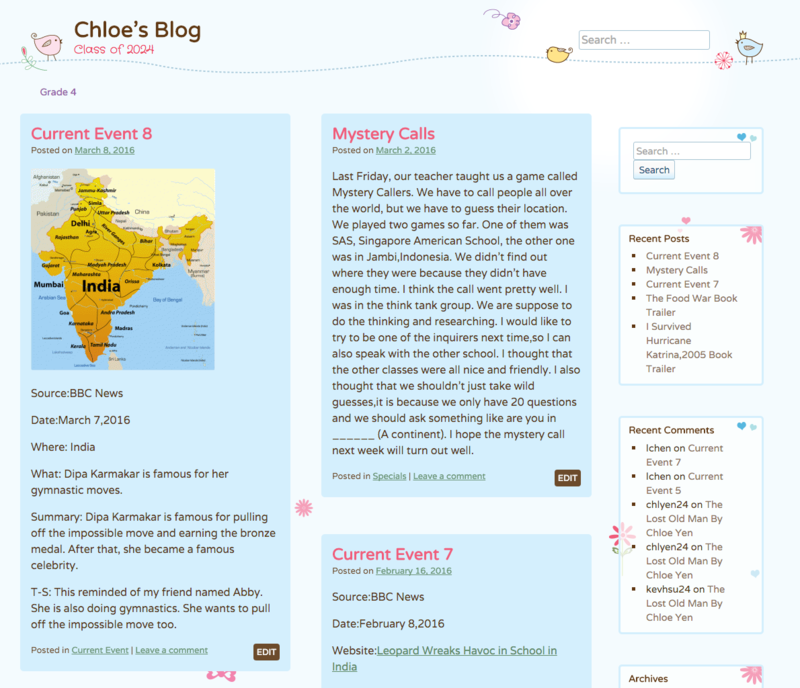 Dig into the world of students digital portfolios. Discover how Grade 1 students collaborated with an Aussie class. Every student should curate a collection of his/her best works online to form a digital portfolio that is easily shareable. This depository can host assignments from all grades and all subjects, bar none. In math students can showcase how-to videos, in PE students can display photos of their movements, in science reflect on experiments (the list is long and in an upcoming article we will share more of your best ideas)… As teachers, our role is to help build students digital portfolio. We will show you in this article how simple it is to get started. Path to improvement – Students can use their portfolio to reflect upon strengths and weaknesses and ways to improve. Academic identities – Portfolios help students discover and build their academic identities by connecting learning across courses and times. Global citizens – Compiling works on a digital platform enables students to engage in global discussions with peers from around the world. Map of improvements – the original goal of all students portfolio obviously applies to digital media in that it gives teachers access to a record of a student across years to witness their improvements in multiple areas, and most specifically in writing. Vertical alignment – They can use students artifacts to visualize the vertical alignment of curriculum across grades. Panorama of assignments – Through their websites, a teacher can quickly visualize the students experience with specific types of assignments. Understanding their level of proficiency, in turn allows for differentiated instructions. 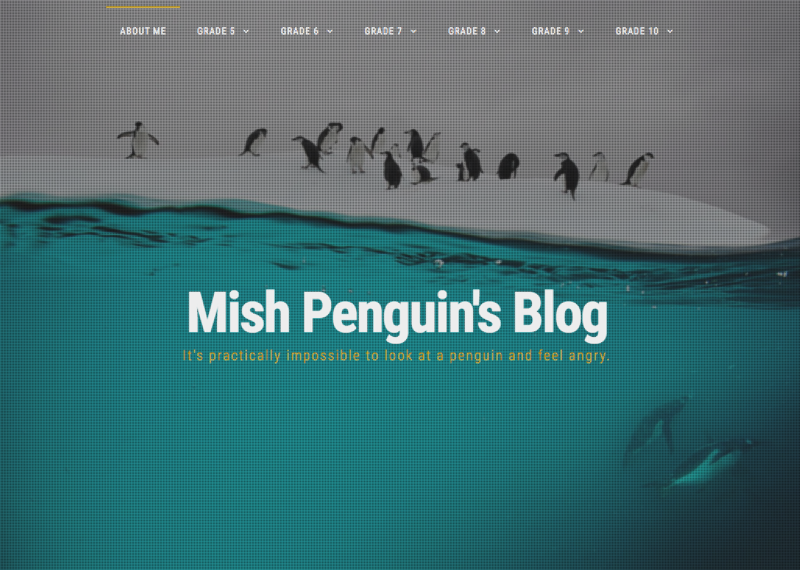 Showcase of exemplar works – Especially for teachers who curate their own website, nothing improves the quality of an assignment more than a clear gallery of previous exemplar works. On my teacher website, this showcase of students work build up excitement for upcoming assignments and boosted students to try to do better than those who came before them. The adoption by all faculty and students of a common platform across an entire institution is the keystone to successfully build students digital portfolio. At KAS, we chose WordPress as the engine powering the 900+ websites of the [email protected] portal. Considering that WordPress, born in 2003 is a free and open source content management system which now powers a quarter of all known website, we feel confident of the perennity of the skill-set which students will learn by using this platform (W3 Techs, 2016). Once you have learned the fundamentals about creating a website at [email protected] (hint: it is as easy as clicking login in the top left corner) and you know how to add and manage content within the WordPress interface, I would argue that the last and most important piece to master is how to create a well organized navigation system for the website. After pooling all the teachers who use students websites in their classes on a regular basis, the system which Gene Chagaris proposed is clearly the most adequate. Gene urged us to use a simple menu organized by grade, then subjects. The alternative (subjects, then grade) did not allow for enough fluidity across schools where subjects may be broken down into different sections (e.g. 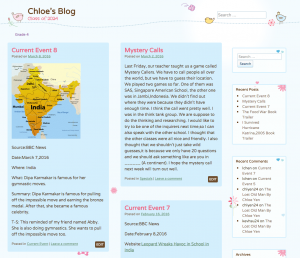 Reading and Writing in Elementary School which become Language Arts in Middle School).This simple menu, visitor’s to the site will be able to quickly browse through many years of articles written by a student in her portfolio. 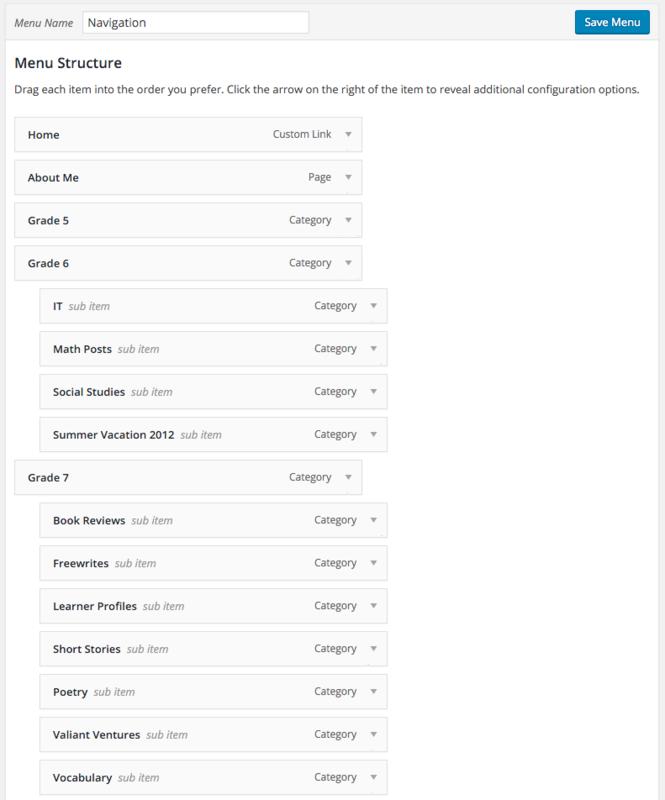 Create categories by grade level, and sub-categories by subject, and assigning posts to categories. 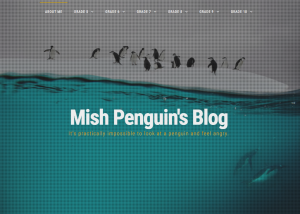 Create a menu with all categories, and properly placing the menu within your theme. From your website dashboard, click on Posts > Categories. Type the grade level (e.g. “Grade 10”) as the category and leave parent category as none. 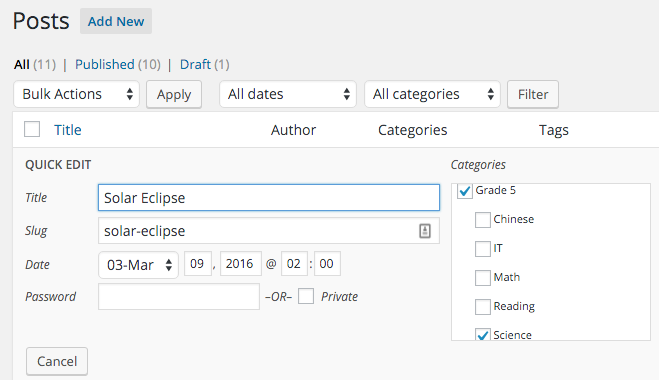 This will define the grade as a top-level category. Type the subject as the category and under parent, choose the grade level this subject was studied in (e.g. : “English” parent “Grade 10” will make English a sub-category of Grade 10). Rinse and repeat for all your grades and subjects. 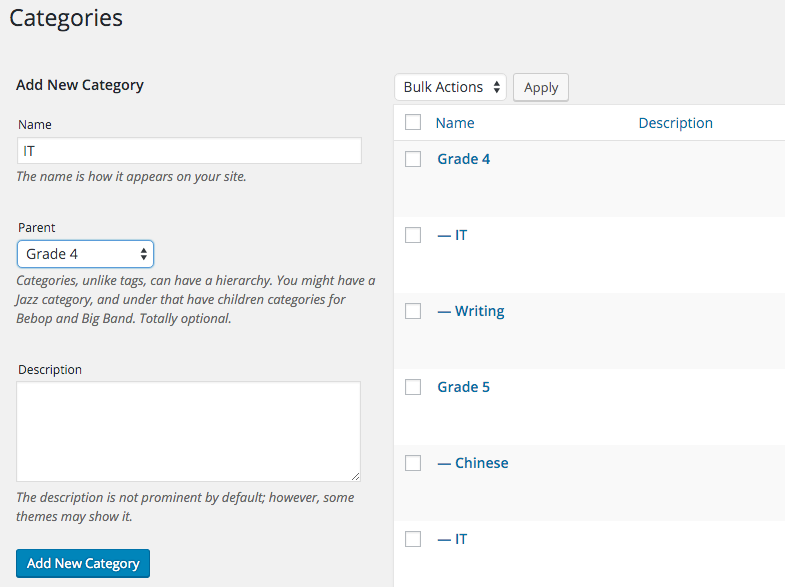 From the All Posts menu, you can now quickly edit each post to add them to specific categories. From your website dashboard, click on Appearance > Menu. Choose a name for your menu and click on Save. Click on Categories, click on Select All to bring all grades and subjects into your menu (but leave out Uncategorized). Click on Add to Menu. Drag the subjects slightly to the right, so they can become menu items of each grade. 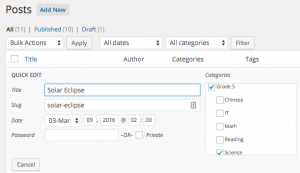 Now that this simple menu is in place, clicking on a subject under a grade will bring you to all the articles published by a student under that grade. Finally but just as important as all the articles the students and faculty will published, the About Me page brings the viewer a human context and relevance to what they are about to read. It is invariable the first page I click on when I land on a website so I can learn more about its publisher. Sandy Su amply deserves the tip of the hat this week for the cross-continental collaboration she immersed her Grade 1 students into. After connecting with Roxanne Levett in Perth, Australia via Twitter (this exchange facilitated by Technology Learning Coach Tom Hammerlund), the Australian grade 2 students were able to leave feedback for Sandy’s students whose work were published in their digital portfolio hosted on [email protected] Awesomeness! Miller, Ross. “The Benefits of E-portfolios for Students and Faculty in Their Own Words.” Tomorrow’s Professor Mailing List. Stanford Center For Teaching and Learning, 2009. Web. 11 Mar. 2016. “Usage Statistics and Market Share of WordPress for Websites.” W3 Techs – Web Technology Surveys. 2016. Web. 11 Mar. 2016.